In November 1939 Madeleine Blaess, a French-born, British-raised student, set off for Paris to study for a doctorate in Medieval French literature at the Sorbonne. In June 1940, the German invasion cut off her escape route to the ports, preventing her return to Britain. 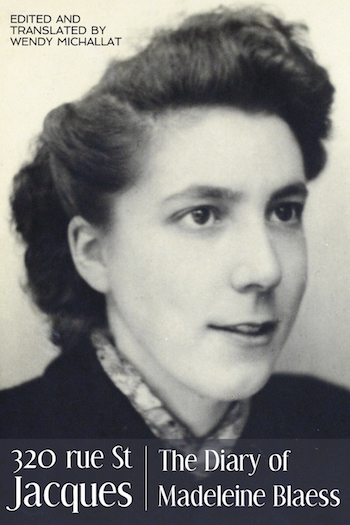 She was forced to remain in France for the duration of the Occupation and in October 1940 began to write a diary. Intended initially as a replacement letter to her parents in York, she wrote it in French and barely missed an entry for almost four years. Madeleine’s diary is unique as she wrote it to record as much as she could about everyday life, people and events so she could use these written traces to rekindle memories later for the family from whom she had been parted. Many diaries of that era focus on the political situation. Madeleine’s diary does reflect and engage with military and political events. It also provides an unprecedented day-by-day account of the struggle to manage material deprivation, physical hardship, mental exhaustion and depression during the Occupation. The diary is also a record of Madeleine’s determination to achieve her ambition to become a university academic at a time when there was little encouragement for women to prioritise education and career over marriage and motherhood. Her diary is edited and translated here for the first time. Dr Wendy Michallat was born in West Yorkshire. She studied at the Universities of Warwick and Nottingham and lectures in the School of Languages and Cultures at the University of Sheffield. She researches and teaches French cultural history, life-writing and popular culture and has published on diverse subjects including cartoon art, women’s football and first-wave French feminism. Alongside the diary translation Dr Michallat has brought together a range of resources including a film about Madeleine's time in Paris, and also teaching resources for schools. These can be accessed via the project website.